Athletic mouthguards become highly contaminated with wear and should be sanitized daily, recommends a recent study. Consistent with previous studies, researchers at Oklahoma State University found that mouth guards harbor a range of pathogenic and opportunistic bacteria, yeasts, and molds. Soaking mouth guards (boil-and-bite and custom) in a sanitizing solution (NitrAdineTM) produced a significant drop in bacteria (e.g. Staphyloccccus), yeast (e.g. Candida), and mold (e.g. penicillin), the study reported. Because mouthguards rapidly become recontaminated, daily sanitizing is recommended. Staph bacteria found on mouthguards can not only cause skin infections but are also associated with heart problems (endocarditis, pericarditis), pneumonia, osteomyelitis, and food intoxication. Other species of bacteria and fungi found on football and hockey mouth guards are associated with many diseases, including meningitis, urinary tract infections, peritonitis, gum disease, wound infections, and exercise-induced asthma. Two studies have found that some commercially available mouth guards are contaminated even before use. The microbes found on mouthguards "are sufficient to warrant genuine concern," says Richard T. Glass, Ph D, DDS, lead author of the study at the Oklahoma Sate University Center for Health Sciences in Tulsa. In addition, the authors noted, "the condition of [mouth guards] after wear may facilitate disease transmission" because the jagged, sharp areas of a typical mouth guard are close to veins in the mouth and to the body's entire circulatory system. A previous study reported an increase in the number and severity of injuries to the mouth among football players over the course of a season. The large number of bacteria and yeasts found in the new study supported a finding of a relationship between the contaminated mouth guards and the oral leasions. Also of concern, the study authors said, is that the typical location of mouth guards between plays outside the mouth exposes them to a range of environmental microbes. 1. Glass RT, Conrad RS, Kohler GA, Warren AJ, Bullard JW. Microbiota Found in Protective Athletic Mouthguards. Sports Health 2011 (http://sph.sagepub.com/content/early/2011/03/29/1941738111404869.abstrac...  (accessed April 9, 2011). 2. Glass RT, et. 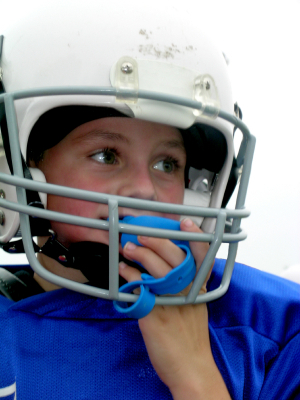 al, Protective Athletic Mouthguards: Do They Cause Harm? Sports Health: A Multidisciplinary Approach. 2009.1(5); 411-415.